The Grand Palace is a complex of buildings at the heart of Bangkok, Thailand. The palace has been the official residenceof the Kings of Siam (and later Thailand) since 1782. 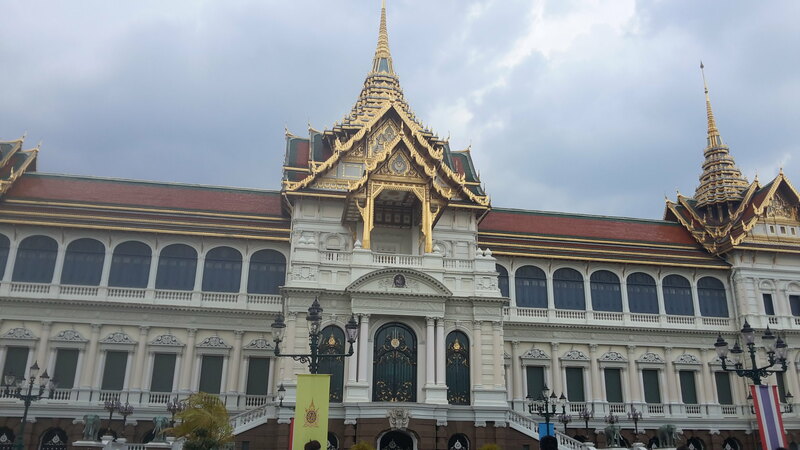 The Grand Palace is still used for official events. Several royal ceremonies and state functions are held within the walls of the palace every year. The palace is one of the most popular tourist attractions in Thailand. Construction of the palace began on 6 May 1782, at the order of King Phutthayotfa Chulalok(Rama I), the founder of the Chakri Dynasty, when he moved the capital city from Thonburi to Bangkok. Throughout successive reigns, many new buildings and structures were added, especially during the reign of King Chulalongkorn (Rama V). By 1925, the king, the Royal Family and the government were no longer permanently settled at the palace, and had moved to other residences. The shape of the palace complex is roughly rectangular and as per Wikipedia, has a combined area of 218,400 square metres (2,351,000 sq ft), surrounded by four walls. It is situated on the banks of the Chao Phraya River at the heart of the Rattanakosin Island, today in the Phra Nakhon District. Rather than being a single structure, the Grand Palace is made up of numerous buildings, halls, pavilions set around open lawns, gardens and courtyards. Its asymmetry and eclectic styles are due to its organic development, with additions and rebuilding being made by successive reigning kings over 200 years of history. It is divided into several quarters: the Temple of the Emerald Buddha; the Outer Court, with many public buildings; the Middle Court, including the Phra Maha Monthien Buildings, the Phra Maha Prasat Buildings and the Chakri Maha Prasat Buildings; the Inner Court and the Siwalai Gardens quarter. The Grand Palace is currently partially open to the public as a museum, but it remains a working palace, with several royal offices still situated inside. Admission to the Temple of the Emerald Buddha and the Central Court of the Grand Palace is 500 Baht (12.99 USD). Note that the admission fee also includes an admission ticket to Vimanmek Mansion and some other sights around Bangkok (the exact list varies from time to time) that can be used within seven days of your Grand Palace visit. Note that there is a strict dress code for instance Men must wear long pants and shirts with sleeves — no tank tops. If you’re wearing sandals or flip-flops you must wear socks (in other words, no bare feet.) Women must be similarly modestly dressed. No see-through clothes, bare shoulders, etc. Please note that I personally visit Grand palace in October 2016.